I was hoping that I would never have to see your face. I tried really hard to ensure that I would never even have to learn your name, but social media and its passively cruel games in hopes of connecting people together had another plan. I didn't recognize your face, or your name, but we had a few friends in common, and I definitely recognized the man standing next to you in your profile picture. And my world stopped turning. I know what you’re thinking right now-crazy ex-wife is stalking your profile because you’re dating her ex-husband and she’s mad. And jealous. And sad. And I don’t blame you, but, you would be wrong. My world stopped turning because I was overcome with fear for you. You look so innocent. Your smile looks genuine, kind. You seem happy. I recognize your smile and that picture because it was mine a few years ago, standing next to the man you are now, probably thinking the same happy thoughts. And I can’t express to you how much I apologize to you for it. You see, my ex-husband is not who he’s making himself out to be in this very moment. He is not the charming, happy, loving, affectionate person who you believe that you have found. I’m sure he has told you that he’s divorced (and some not-so-pretty “things” about me), and maybe even a little bit of his family history, and maybe even a few other quips of smaller things in his life that he has “overcome”, enough to make you feel badly for him, proud of him for where he is today, and even a little lucky for being with someone who has been through what he has. He is a broken bird who which you instinctively want to save, but my darling girl, you simply cannot. He will eventually stop smiling. He will eventually stop the affection. All of a sudden he will go from perfectly calm to a complete irrational hurricane in a matter of seconds-and it will be all your fault. He will tell you he’s done with you at least a dozen times in those moments yet doesn't mean it, but for your own sake, I hope that you do. He will tell you it’s because of his drinking, or because of his father, or because of the life that’s been handed to him. He will list off all of the reasons for why he is the way he is as justification. He will tell you it will never happen again, but it will. And then those fits of verbal and emotional warfare turn into something much, much worse. And it costs your entire existence as the human being you are right now. You will change, not on purpose, and not really knowingly, but that’s what the professional abusers do. They get you to change and turn into who they want you to be without you even knowing it. And you, my dear, are with not only a professional, but a master. Before you know it, you won’t speak to your family as often. Your friends will become a seemingly distant memory. Your life, as you know it, will become only him. I’m sure your family is a loving, supportive group of people and you will want to involve him in this because you love him (or will love him) and also a small part of you hopes that your family will rub off on him and give him something he never had. Let me make this clear: he did have it. He had (and has) a wonderful family that he CHOSE to do the things he did to, not the other way around. He had all the love and support and sunshine and rainbows and butterflies and puppies that anyone could ever ask for-and it still wasn't good enough. I’m sorry, but you and your family will never be good enough. Not for this type of man. Mine is still healing from him as well. The truth about this man is simple: he does not know how to love. He believes in a love and a life that isn't real, and therefore, he will never truly be happy. And when he isn't happy, bad things happen. Life changing things. I can sit here and name every horrible thing that occurred throughout our relationship and marriage, but I don’t think you want to hear it, and frankly I have worked extremely hard to stop reliving it. But it’s an everyday fight for me. 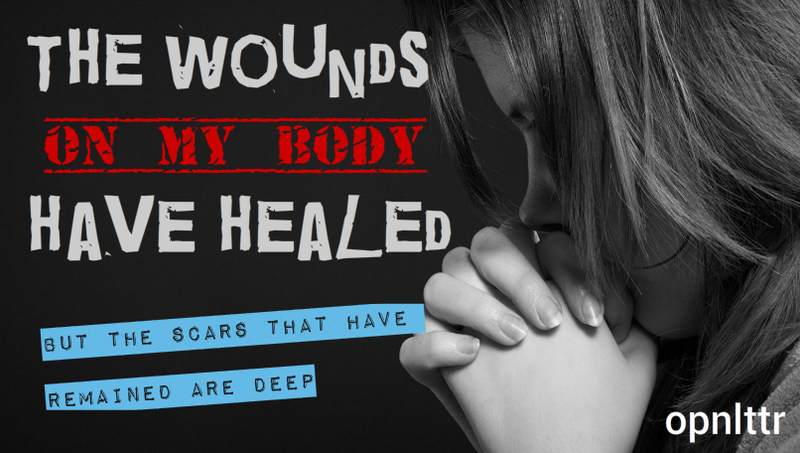 The wounds on my body have healed, but the scars that have remained are deep. I’m sorry that I allowed him to believe that what he was doing to me was right for as long as I did, because now he very well could do this to you. I’m sorry that his lies and his games were so convincing that I wholeheartedly believed him, because now he thinks they are bulletproof. I’m sorry I didn't fight harder to have something be done, instead of just finding the strength to leave, I wish I could done both. I’m sorry I let this man be free to find you. You may still be thinking that this is all just a vindictive move against him, and that’s okay. I get it. I didn't want to listen to it either when I was you. But you have to know that I have nothing to gain from this. My life is amazing, it’s peaceful, and it’s complete. I have my family back, I am in a relationship that has shown me what true love actually is, and I even just bought a new car (one I was told I would never be “allowed” to buy). I have nothing to gain from you leaving my ex-husband. You get to keep that beautiful smile of yours. You get to have a future that doesn't include worrying if he’s really where he says he is. Or with who he says he’s with. Or if you’re good enough. Or if he really meant to say the things he did. Or above all, if your night will end in variations of happiness, or with your body on the floor. You get to remain you, scar-free, and happy. I have worked tirelessly to get back to the human I was before him, and while I know I’m forever changed, having my sense of person back has been the best feeling I could ask for-and exactly why I don’t want you to ever lose it in the first place. And I can promise you, you are worth that. I never wanted to know who his next victim was. I never wanted to know the next woman who would have to go through even an ounce of what I did. I never wanted to have to worry or care about the next one, as I’m still and will always be healing myself. And that’s why I never wanted to see your face. You may want to listen to these Top 10 Break-Up songs whilst reading this letter! I wouldn't have changed a word! I am the woman you wrote that letter to, I met and fell in love with this person you were once married to. I believed the lies and I paid the price. I wish I had read your letter or at least one like it and had been warned before hand. I loved his kids and his kids loved me. I trusted him with my heart and my kindness and allowed him into my life and he left me nearly destroyed. Someone new is in my shoes now and she is paying the price of making the same mistakes as I did. His kids are also paying the price or will soon. Abusers rob and steal souls. They never take account for any of their actions and continue to tear destruction where ever they go. I didn`t spend years with him and I got out before the physical abuse started but I saw the emotional, verbal and financial abuse. I am still recovering and the relationship lasted less time than its taken to heal. I am glad you wrote the letter. I felt your pain because I lived it too. I`m lucky I guess that I didn't endure it as many years as you but I have been told by my actual ex boyfriend`s ex wife that I endured worst behavior because he is making other`s pay for the anger at her standing up to his abuse and ending the marriage. How was I to know. Had I educated myself on the warning signs of abuse I may have been able to save myself and in many ways I did but it sure as Hell wasn`t easy. Abusers are sociopaths and narcissists.When you learn what exactly the characteristics of such a person is you have power. From there you can protect yourselves from further abusers but there is still no guarantees. I just wanted to say Thank You though for writing this letter and giving the warning to others that some of us never receive till its too late. We are learning ! !